May 25, 2007: A scientist using the Solar and Heliospheric Observatory (SOHO) has found a way to forecast solar radiation storms. The new method offers as much as one hour advance warning, giving astronauts time to seek shelter and ground controllers time to safeguard their satellites when a storm is approaching. "Solar radiation storms are notoriously difficult to predict—they often take us by surprise," says physicist Arik Posner who developed the technique. "But now we've found a way to anticipate these events." Posner is a member of the research staff of the Southwest Research Institute in San Antonio, Texas; he also works at NASA Headquarters in Washington, DC. His study, Up to one-Hour Forecasting of Radiation Hazards from Solar Energetic Ion Events, appears in the journal Space Weather. Solar radiation storms are swarms of electrons, protons and heavy ions accelerated to high speed by explosions on the sun. Here on Earth we are protected from these particles by our planet's atmosphere and magnetic field. Astronauts in Earth orbit are fairly safe, too; Earth's magnetic field extends out far enough to shield them. The danger begins when astronauts leave this protective cocoon. The Moon and Mars, for instance, have no global magnetic fields, and "astronauts working on the surface of those worlds could be at risk," says Posner. "A one hour warning would reduce the odds of an astronaut being caught in a solar storm outside of a lunar habitat, where astronauts are most vulnerable," notes Francis Cucinotta, chief scientist for NASA's Space Radiation Program. Spacecraft and satellites would also benefit. Subatomic particles striking CPUs and other electronics can cause onboard computers to suddenly reboot or issue nonsense commands. If, say, a satellite operator knows that a storm is coming, he can put his craft in a protective "safe mode" until the storm passes. The type of particle most feared by astronaut safety experts is the ion, that is, an atom which has lost one or more of its charge-balancing electrons. "Energetic ions can damage tissue and break strands of DNA, causing health problems ranging from nausea to cataracts to cancer," says Cucinotta. So the goal is to predict when the ions will arrive. The key to that, it turns out, is electrons. "Electrons are always detected ahead of the more dangerous ions," says Posner. 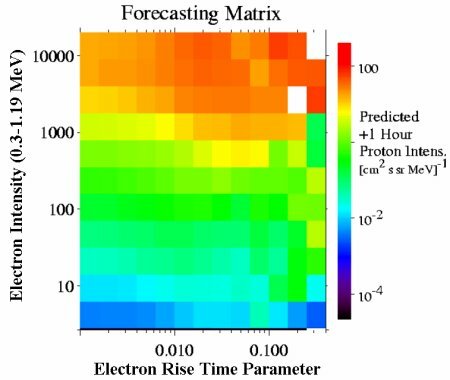 This has been known for years, but only recently has Posner's research turned the "electrons first" aspect of radiation storms into a tool for forecasting. 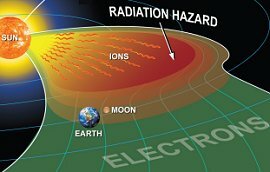 Every radiation storm is a mix of electrons, protons and heavier ions. The electrons, being lighter and faster than the others, race out ahead. They are like heralds proclaiming the ions are coming! Posner realized that by measuring the "rise time and intensity of the initial electron surge" he could tell how many ions were following and when they would arrive. The key to the breakthrough was the COSTEP instrument onboard SOHO. COSTEP is short for "Comprehensive Suprathermal and Energetic Particle Analyzer." Essentially, the device counts particles coming from the sun and measures their energies. 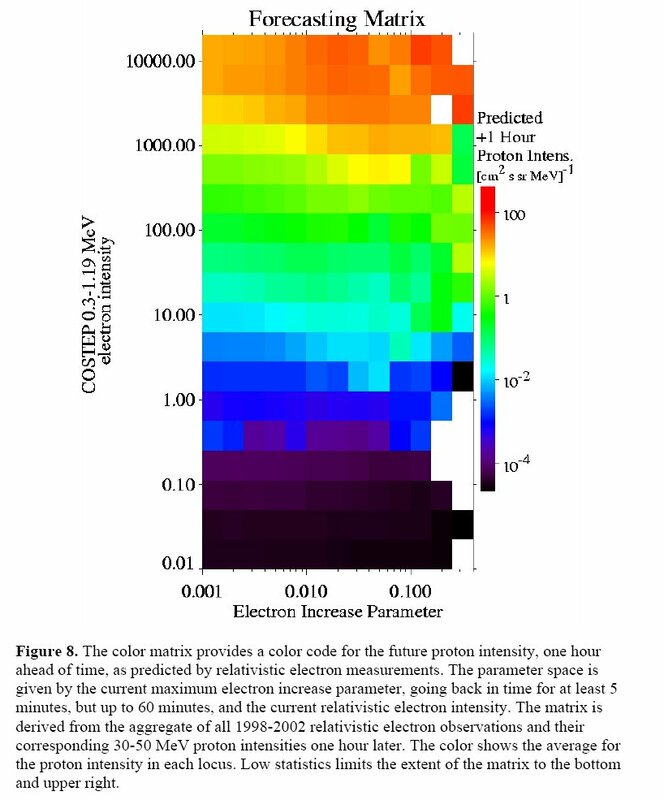 Posner looked at hundreds of radiation storms recorded by COSTEP between 1996 and 2002, and he was able to construct an empirical, predictive matrix: "Plug electron data into the matrix, and an ion forecast pops out." The next step was to test his results. He decided to try out the matrix on COSTEP data gathered in 2003, a year he hadn't yet analyzed and which formed no part of the matrix itself. "I applied the matrix to the electron data; it successfully predicted all four major ion storms of 2003 with advance warnings ranging from 7 to 74 minutes." 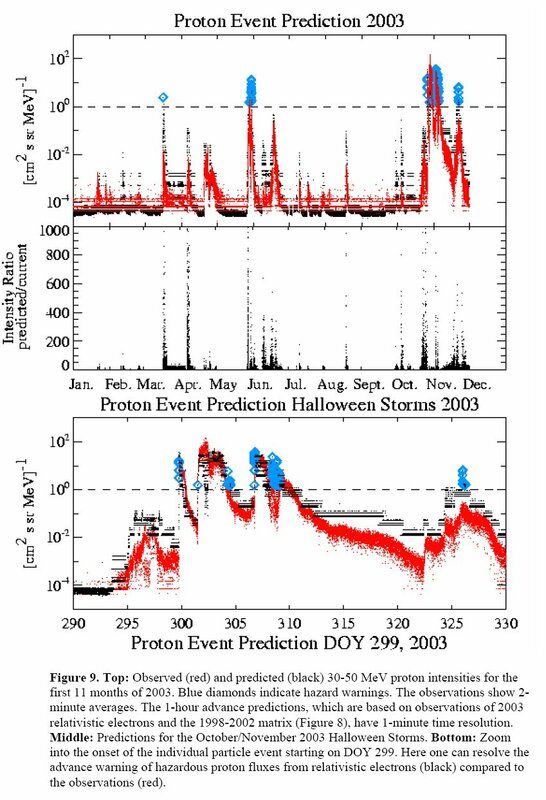 Above: Posner's ion storm forecasting matrix. to view a more complete version of the matrix with extended caption. Posner says the method is not yet perfect. He points out, for instance, the brief seven minute warning for one storm in 2003. "I'd like to improve that," he says. "The matrix also generated three false alarms for 2003—that is, storm alerts followed by weak storms or no storms at all." In those few cases, astronauts would have dashed to safety unnecessarily. Improvements will come as Posner works his way through even more of COSTEP's rich dataset: "Launched with SOHO in 1995, COSTEP has been operating through an entire solar cycle including the solar maximum in 2001—and it is still going strong," says Prof. Bernd Heber, COSTEP's principle investigator at the University of Kiel in Germany. The method is currently being considered by planners at the Johnson Space Center in their design of future lunar missions. "Posner's technique reduces the odds of exposure by more than 20 percent compared to current methods, allowing astronauts to venture farther from their outpost," says Cucinotta. "That's good news for both science and exploration." Who's Afraid of a Solar Flare? -- (Science@NASA) Solar activity can be surprisingly good for astronauts. Can People Go to Mars? -- (Science@NASA) Cosmic rays pose a threat to astronauts bound for Mars. How dangerous is it out there? NASA scientists are working to find out.